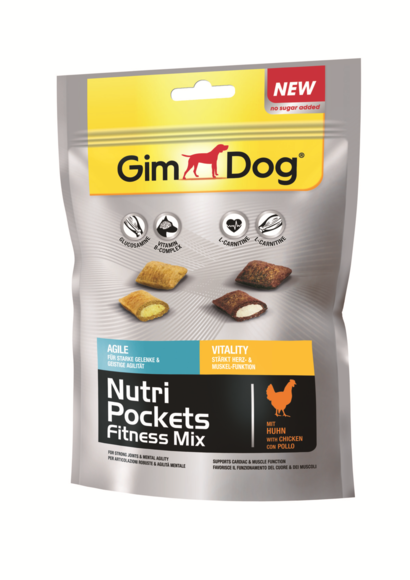 GimDog Nutri Pockets Fitness Mix are crispy pouches with a tasty filling. Agile: Glucosamine supports healthy muscles and joints. The vitamin B-complex supports the responsiveness and perception of your dog. Vitality: L-carnitine supports cardiac health and promotes your dog’s muscular development in combination with exercise. Grain, meat and animal by-products (chicken 12%), oils and fats, vegetable protein extracts, vegetable by-products, minerals, yeast, methyl-sulphonyl-methane, milk and dairy products, chrondroitin sulphate, glucosamine sulphate (in Agile pad: 0.1%), molluscs and crustaceans.